This near-infrared, color view from Cassini shows the sun glinting off of Titan's north polar seas. Credit: NASA/JPL-Caltech/Univ. Arizona/Univ. Idaho. In a new study, researchers found that small liquid lakes in Titan’s northern hemisphere are surprisingly deep. The finding was made based on the data from NASA’s Cassini spacecraft. The study provides the first confirmation of how deep some of Titan’s lakes are (more than 300 feet) and of their composition. Cassini gathered the data in 2017 on its final flyby of Saturn’s largest moon. It showed that the lakes are filled with methane. Titan is the only planetary body in our solar system other than Earth known to have stable liquid on its surface. Previous research has shown that Titan is different from Earth because it uses methane and ethane to form clouds and rain. Methane and ethane usually exist as gases on Earth unless they’re pressurized in a tank. On Titan, the surface temperature is cold so these hydrocarbons exist as liquids. Recent studies have found that Ontario Lacus is the only major lake in Titan’s southern hemisphere. The lake has a roughly equal mix of methane and ethane. 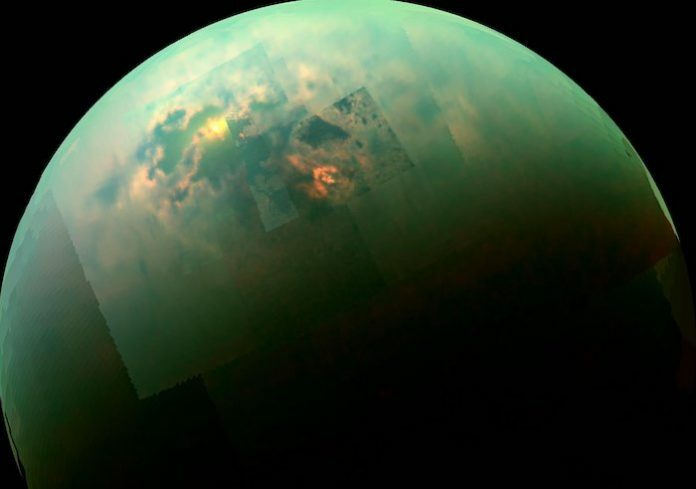 The researchers suggest that the hydrology on one side of the northern hemisphere of Titan is completely different from that of another side. On the eastern side of Titan, there are big seas with low elevation, canyons, and islands. On the western side, however, there are small lakes. In the current study, the data showed that the lakes perched atop big hills and plateaus. New radar measurements confirm that the lakes are far above sea level. They also showed landforms sticking hundreds of feet above the surrounding landscape. There are deep liquid lakes on top. These small, deep lakes tell the team something new about their geology. They were likely formed when the surrounding bedrock of ice and solid organics chemically dissolved and collapsed. The team analyzed Cassini data and found these lakes are transient lakes with strong changes in liquid levels. They suggest that hydrocarbon rain feeds the lakes and then the lakes can evaporate back into the atmosphere or drain into the subsurface, leaving reservoirs of liquid stored below. The researchers suggest the finding provides new information about the way liquid methane rains on, evaporates from and seeps into Titan and help scientists understand the hydrology of Titan better. The lead author of the study is Marco Mastrogiuseppe, Cassini radar scientist at Caltech in Pasadena.